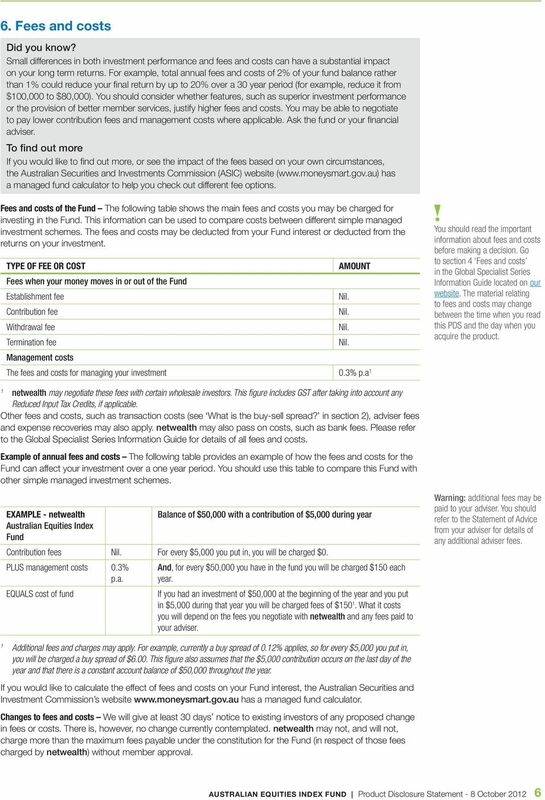 Download "Australian Equities Index Fund"
4 3. Benefits of investing in the Fund Indexing The Underlying Fund is managed as an index fund. Index funds are designed to provide an investment return that matches or is similar to the investment return of a particular market index. Market indices measure the performance of particular types of investment. Often they measure the performance of shares and other investments listed on a stock exchange. Currently the market index chosen is the S&P/ ASX 300 Accumulation Index 1 which measures the performance of about 300 stocks listed on the Australian Securities Exchange. Index funds have a number of advantages: clarity of investment objective the investment objective of an index fund is easy to understand it is to mirror as closely as possible the return of the chosen index; ease of measuring performance - the performance of the fund in achieving its investment return objective is easy to measure because the fund s performance is easy to compare with the index s performance; lower operating costs index funds do not require the same level of investment analysis and stock selection as active funds because their investments mirror the chosen index. This reduces the costs of investment management of the funds; lower transactions costs as index funds hold the investments that make up a market index and as these investments generally only change slowly over time, there are usually less costs of buying and selling investments; taxation efficiency as index funds do not buy and sell investments as much as actively managed funds and as they generally hold investments for longer, they tend to have less tax liabilities for investors; and diversification as index funds have an exposure to all of the investments that make up a market index, they are usually highly diversified which means that investors are less exposed to the performance of individual investments. The disadvantage of index funds is that they will not outperform the chosen index. 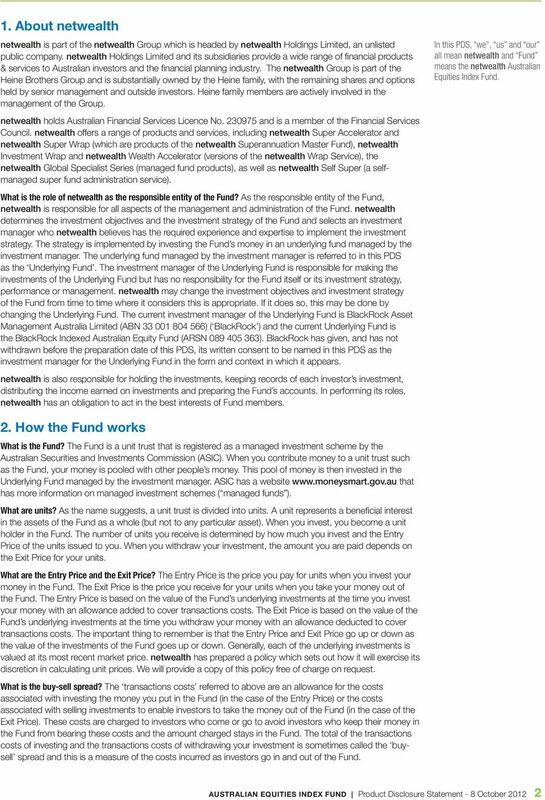 1 The netwealth Australian Equities Index Fund is not sponsored, endorsed, sold or promoted by Standard and Poor s (S&P) or Australian Stock Exchange Limited (ASX), and neither S&P nor ASX make any representation regarding the advisability of investing in the Fund Access to professional investment managers By investing through the Underlying Fund, the Fund gives you the benefit of access to a professional investment manager selected by netwealth who can use its resources, experience and expertise with the aim of achieving the investment return objective for the Underlying Fund, which in turn will assist in the achievement of the investment return objective that netwealth has set for the Fund. The investment return objective is described in section 5. Pooling of investors funds The pooling of a number of investors funds assists the investment manager of the Underlying Fund in implementing its indexing strategy efficiently. A simple way of investing and switching your investment The Fund provides a simple way of investing your money and allows you to get access to it when you need to. 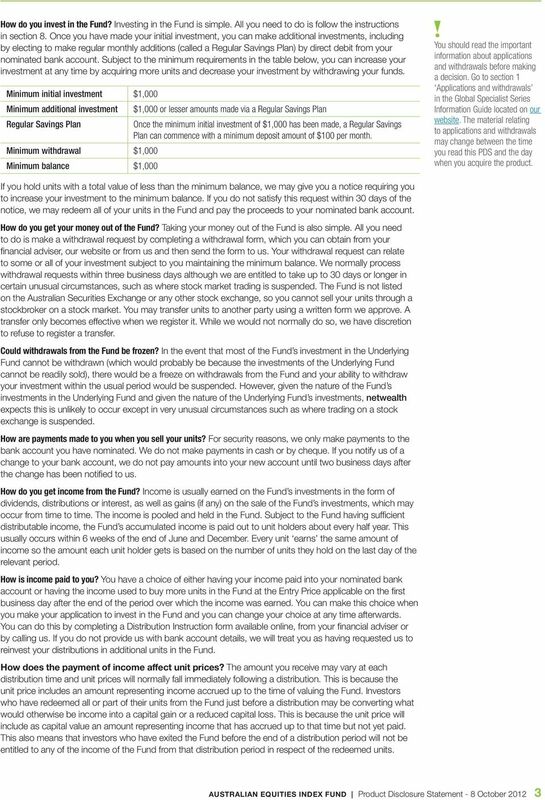 Generally, you can withdraw your investment in the Fund at any time as described in section 2. 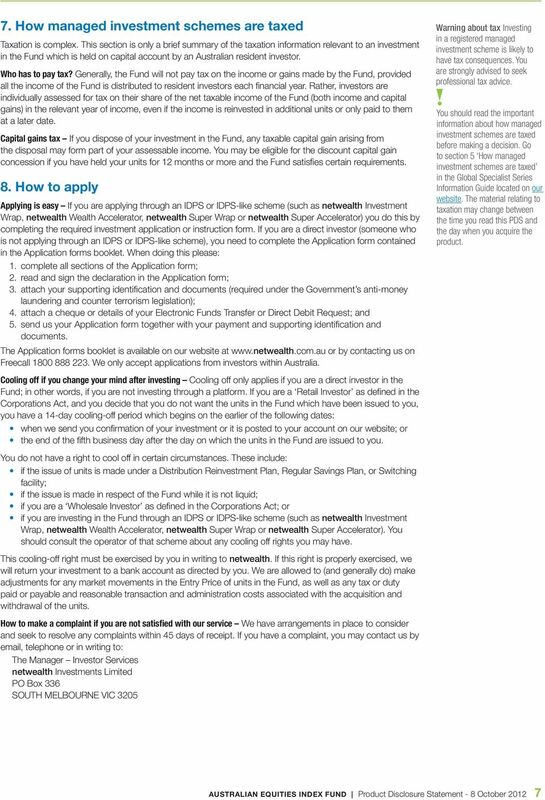 There are currently ten other funds in the netwealth Global Specialist Series, each with its own investment strategy and investment return objective, and it is easy to switch funds if you decide you wish to change your investment in the future (see section 5). Online information about your investment As an investor in the Fund, you have online access to obtain information about your investment. Regular reporting You receive the following regular reports to help keep track of your investment: an Annual Taxation Statement to assist you to complete your tax return; an Annual Statement with details of your unit holding, transactions and fees; and an Annual Report including the Fund s performance and its accounts and auditor s report. 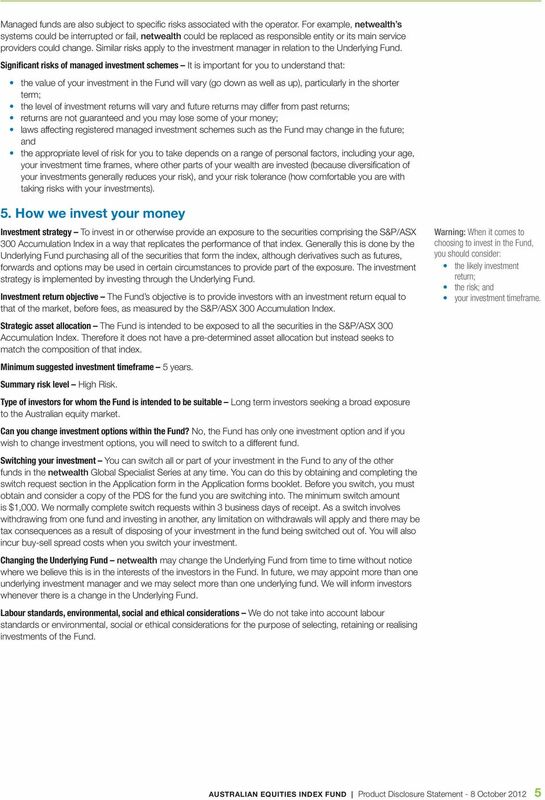 information about benefits of investing in the Fund before making a decision. Go to section 2 Benefits of investing in the Funds in the Global Specialist Series Information Guide located on our website. The material relating to benefits of investing in the Fund may change between the time you read this and the day when you acquire the product. 4. 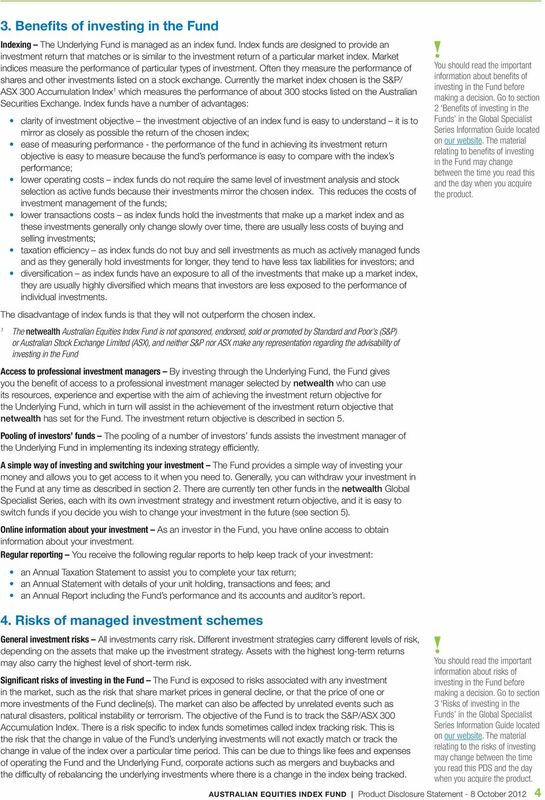 Risks of managed investment schemes General investment risks All investments carry risk. Different investment strategies carry different levels of risk, depending on the assets that make up the investment strategy. Assets with the highest long-term returns may also carry the highest level of short-term risk. 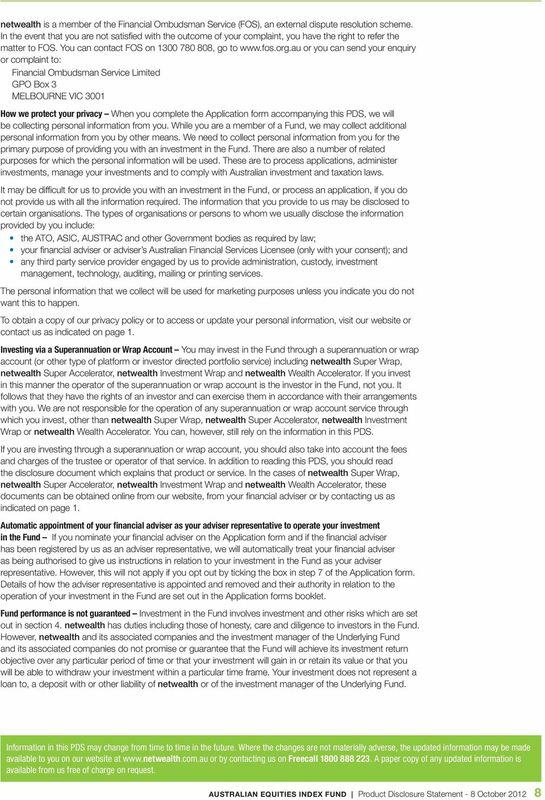 information about risks of investing in the Fund before making a decision. Go to section 3 Risks of investing in the Funds in the Global Specialist Series Information Guide located on our website. The material relating to the risks of investing may change between the time you read this PDS and the day when you acquire the product. 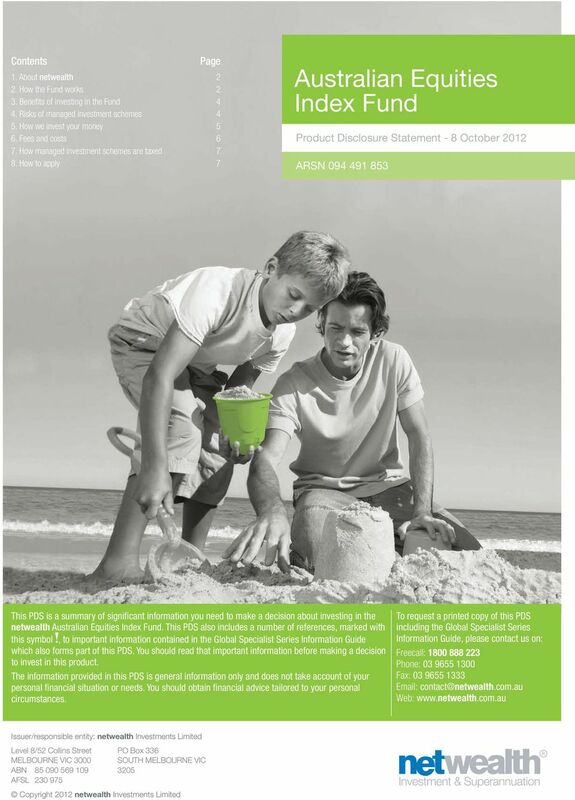 Australian Equities Index Fund Product Disclosure Statement - 8 October Significant risks of investing in the Fund The Fund is exposed to risks associated with any investment in the market, such as the risk that share market prices in general decline, or that the price of one or more investments of the Fund decline(s). The market can also be affected by unrelated events such as natural disasters, political instability or terrorism. The objective of the Fund is to track the S&P/ASX 300 Accumulation Index. There is a risk specific to index funds sometimes called index tracking risk. This is the risk that the change in value of the Fund s underlying investments will not exactly match or track the change in value of the index over a particular time period. This can be due to things like fees and expenses of operating the Fund and the Underlying Fund, corporate actions such as mergers and buybacks and the difficulty of rebalancing the underlying investments where there is a change in the index being tracked.